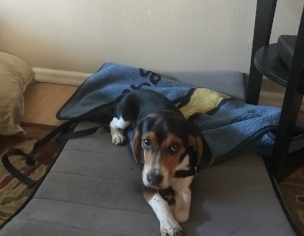 I just started a three-week board & train with Sparky - a 4-month old Beagle pup. The list of issues are, on the surface, typical puppy ones. Inconsistent with house training, not able to be left in a crate without baying (boy does he have a set of lungs on him), limited attention and focus and, absolutely (I kid you not) no impulse control. If it's on the floor, table, ground or wherever he can reach it, whatever it is is in his mouth. So we begin! Sparky poops out! Literally and figuratively! We've finished Day 4 of Sparky's Board & Train program. The first night he bayed (in a high pitch awful and mournful way) in his crate from 10PM to 1AM until he finally stopped and went to sleep and slept until 5am when I finally gave in and put him in bed with me and he allowed me another 2 hours of much needed sleep. Trying to get him to sleep in a crate may not happen. He's probably, of all the puppies I've trained in 15 plus year, one of the most willful and indefatigable. What has been even more important is the house training. I really and truly understand why his poor owner gleefully handed over this 4-month old Beagle. Not only does he bay at almost any provocation, he really doesn't understand where he is supposed to eliminate. He will go outside, but if you are not watching him every second, he will come inside and do it again there. He has now pooped and peed on three of my brand new area rugs. Thankfully, I invested in a new carpet cleaner, but the seagrass rug, which is not new, is also not cleanable, so that one will need to go to the dump. Baying or not, if I cannot watch this puppy like a hawk, he's going into the crate. There will be no more accidents in the house. 2 weeks and 3 days left on Sparky's board and train. Yes, I'm counting the days. And, I still have much work to do. He's pooped and so am I!